15th International Cartoon Festival Competition 2018 Prizren, Kosovo..
Open Call for the 15th edition of International Cartoon festival competition in Kosovo "&gt;Book and Technology"
1.1. 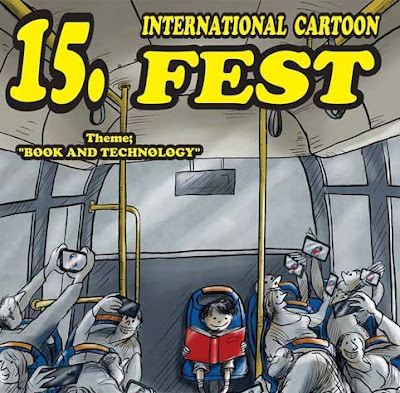 The theme of a festival "Book and Technology". 2.1. Right to participante at this contest have any author worldwide, regardiess of gender age, nationality or occupation. 3.1. You need to send us at least 1 (one) up till 3 (three) Cartoons. (If you decide to send your works via e-mail, minimum resolution for scanned caricature is 300 dpi). 3.2. Cartoons can be work from one or few artists. 3.3. Cartoons can be in black and white technique or in color. - Withhout above mentioned details works (cartoons) will not be considered valid. 4.1. Cartoons should be sent up till 20th of September 2018. 5.1. the festival will be held from 12th - 14th October, 2018 in Prizren, Kosovo. 6.1. The jury will be composed from professional world artists which will make selection of works via internet no later than September 25th, 2018. 8.3.Address: Xhemil Doda #3, 20000, Prizren, Kosovo.